Pentti Sammallahti is a Finnish photographer who represents the coming together of two rather old-fashioned tendencies. A traveller specialised in the far north, he makes toned black-and-white prints that are never specifically about anything much. He’s a reporter on the human condition rather than on any particular subset of it. But he’s really an “auteur” photographer, to borrow a term from the cinema. He makes pictures that are the expression of his sensitivity and of his mood – a kind of work that has been somewhat eclipsed by the more project-based photography we’re familiar with and which is designed to fit into books. Sammallahti’s pictures are exquisitely beautiful according to the old canons: they have rich tones, elegant proportions, subtle and revealing compositions. To dig out another old word, they are Pictorialist images, in which the object itself is a thing of beauty, and not only the sights it describes. Sammallahti is a prodigious book-maker and has published a number of monographs. It is a pleasure, therefore, to find that his original prints make up the stand-out exhibition among the 50-plus at this year’s Arles photography festival. The core of his show is a long wall of horizontal panoramas from 1991-92 from a series called The Russian Way. 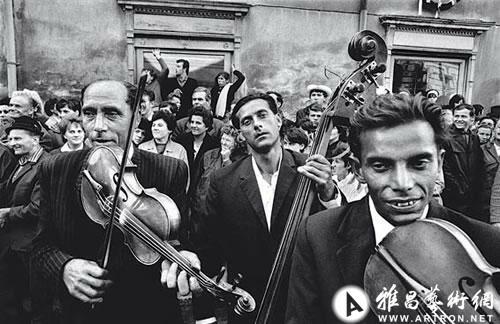 These inevitably invite comparison with the work of Josef Koudelka, as horizontal panoramas with strong compositional elements always will. Certainly, Sammallahti made portraits of gypsies in Hungary in 1979, not long after Koudelka published his great book on the subject. But Sammallahti was already working in panorama at that time. He is not a slavishly derivative photographer, just a literate and up-to-date one. He is also willing – as another great Czech photographer, Josef Sudek, often was – to just let prettiness be pretty. Nothing much happens: a dog looks at a huge tyre abandoned at a roadside. A woman crosses a wooden bridge. A truck eases slowly through a puddle. The photographer’s delight in the quality of natural light and his varied handling of the awkward long shape of the panorama are what do it; no dull horizons bisect these pictures. There are other series in this thorough retrospective. Many of Sammallahti’s animal pictures are here, ranging from the touching to the hilarious. He displays a street photographer’s awareness: when a pigeon marches past a statue of General de Gaulle, it has exactly the statue’s walk; in Iceland, 10 cats wait optimistically underneath a line of drying fish. At his worst, Sammallahti can stray a little too close to calendar photography: too cute in subject, too pretty in production. But he doesn’t stray often. In a splendid set of 10 little portraits (from Tallinn, in 1981) passers-by, singly or in small groups, are caught in front of a stainless-steel hoarding. They are markedly dark of hat and overcoat, and the hoarding gleams and shines. There’s not much to them, but they are restrainedly beautiful. They were originally published as Sammallahti’s Andante, with a simple three- or four-bar piano motif (also by him) to accompany each. This is a showcase for a master craftsman in unfashionable genres, who achieves great poetry simply by being acutely receptive to his own impressions. Since the physical slog of any festival is always toilsome, it is worth noting that the Sammallahti exhibition is in the last of the great railway sheds that are taken over each year for the photography festival, and much of what else is good is there, too. The festival’s theme this year has been to honour the 30 years of the National Photography School, which is in Arles and is intimately connected with the Rencontres. Some of its photographer graduates are honoured with a show here this year, and curators who are former students have been invited to arrange others. So, in the railway workshops a good selection of very varied pictures includes Marina Gadonneix, who won the HSBC award a number of years ago. She shows a disturbing grid of nine very dark pictures from the inside of a house specially built to train fire officers: metallic surfaces where you might expect soft ones, and soot-blackened walls showing the handprints of people feeling their away around through thick smoke. A related group of three shows a sloping driveway down to a roll-over garage door. A closed circuit camera looks down. The door opens, and thick smoke comes out. Arles is not a selling show, but these are prints for collectors to seek out: strong in conception, perfectly made. Another graduate of the Arles school is Sylvie Lécallier, curator of the Musée Galliera, the Paris museum of fashion, who has put together an entertaining and informative account of the role of the model in fashion. This allows for a lot of nice pictures by the likes of Erwin Blumenfeld, Helmut Newton and Guy Bourdin, but it includes good insight, too. We get to meet early supermodels from the days before the word was coined: Nelly Martyl is one to look up – former singer, and hottest model of the period just before the first world war. To see again one of William Klein’s mirror series, when he took a looking-glass out on to the streets of New York with his models, is a highlight. More recently, Juergen Teller’s “Go-Sees”, in which he photographed young aspirant models at their most nervous, make a thoughtful and mildly disturbing series. These are highlights. Arles would not be Arles without the odd turkey, but it is that breadth of choice that makes the festival what it is. There are also debates, lectures, a symposium, screenings, book signings, workshops and a host of fringe activities. This year is no different: it’s not hard to find rubbish, but the good is very good and lingers longer in the mind.